JYP Entertainment 센터 오디션 안내입니다. - 댄스 분야 지원자 중 아이폰7 이상 기종(아이폰 7, 8, X)을 사용하시는 분들은 젠더(헤드폰 잭 어댑터)를 반드시 지참하셔야 합니다. * Date : 2019. Sunday. - User of iphone7 and above(iphone7, 8, X) must submit the gender(headphone jack adapter) together. In case of no gender, you need to perform freestyle dance with the song we play randomly. 2019년 1월의 센터오디션은 “U+아이돌Live와 함께하는 JYP 연습생 공채 15기 오디션”으로 인해 진행되지 않습니다. 또한, 2019년 2월의 센터오디션은 기존의 첫 번째, 세 번째 일요일이 아닌 두 번째, 네 번째 일요일인 2019년 2월 10일과 24일로 변경되어 진행될 예정입니다. 2019년 3월부터는 다시 정상화되어 매 달 첫 번째 세 번째 일요일에 진행될 예정이니, 착오 없으시기를 바라겠습니다. This is JYP Entertainment casting team. 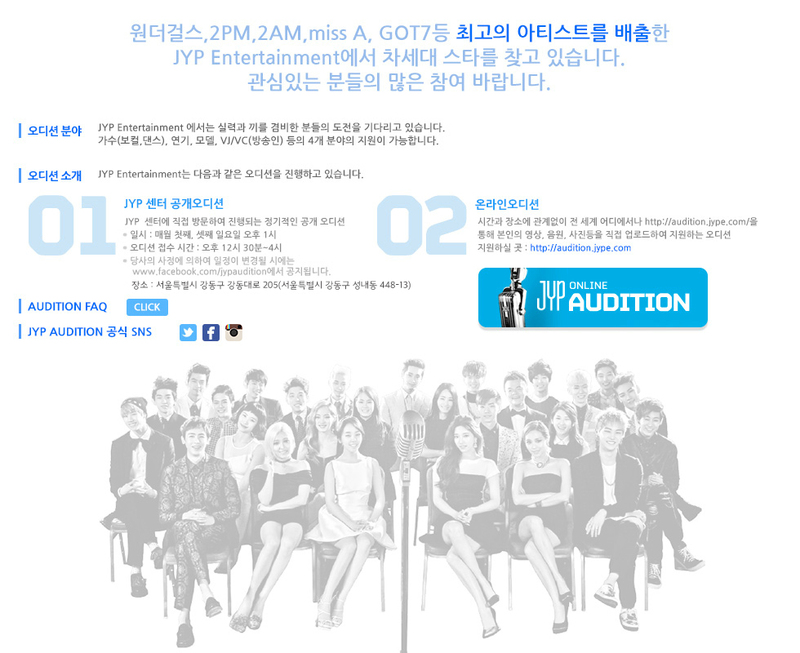 and the JYP Center Audition dates for February has changed. The audition schedule will return to the original routine - every first and third Sunday of the month - starting from March, 2019. Please check the dates listed below. Thank you! * 위 오디션 정보 조회수는 누적된 수치입니다.